Websie localization made easy, Proz.com Free Training Today | What's up @ Skawa? 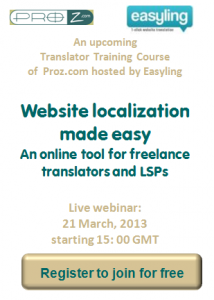 As a part of the Free Training Series organized by Proz.com, Easyling will be hosting a webinar on the hot topic of Website localization. We will show the ultimate online translation tool that helps freelancers and LSPs to give exact quotation, word- and repetition counts for the clients in just one click of a button Easyling will also let you extract the content of any html site and import it to your favorite CAT tool. Moreover, the solution has you easy-to-use real-time preview and in context editing interfaces. If you face the challenges to traditional website translation, you should be watching this web translation tool live. 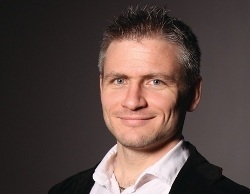 The webinar startsThursday, March 21, 2013 15:00 GMT. Feel free to register on Proz.com to join the training. If you’re eager to learn more about making website translation easy, your place should be guaranteed now by registering to the Live Easyling Webinar. This entry was posted in CAT tools, Conferences, How to, Website translation and tagged Easyling, freelance translator, LSP, Proz.com, translation technology, webinar, XTM by Balázs Benedek. Bookmark the permalink.